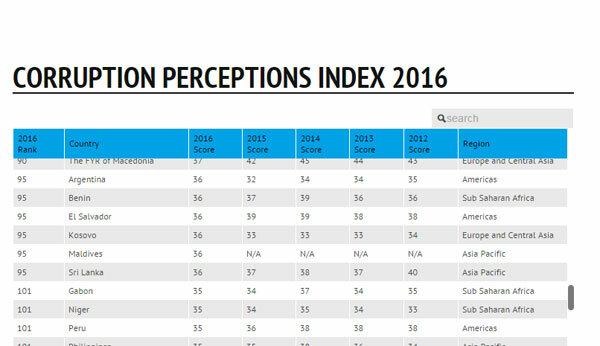 Sri Lanka ranked at 95 in the Corruption Perception Index (CPI) 2016, dropping down the rank by 12 slots when compared to 2015. The report released by Transparency International, the global movement against corruption, ranks countries according to the perceived level of public sector corruption. Sri Lanka was ranked at 95 out of 176 counties with a poor score of 36 when compared to 2015 when the country was ranked at 83 among 168 countries. Denmark together with New Zealand topped the list with a score of 90 followed by Finland, Sweden and Switzerland ranked 3rd, 4th and 5th respectively, as the least corrupt countries. India was ranked the least corrupt in the South Asian region with a score of 40 and was ranked at 79 in the overall index. 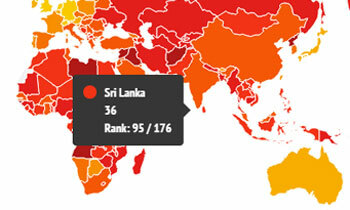 Following India, Sri Lanka and Maldives were jointly ranked at 95. The ranks based on a scoring system that ranges between 0 (public sector perceived as highly corrupt) to 100 (public sector perceived as very clean). The Corruption Perceptions Index aggregates data from a number of different sources such as the business community and country experts on the level of corruption in the public sector. CPI 2016 is calculated using 13 different data sources from 12 different institutions that capture perceptions of corruption within the past two years. 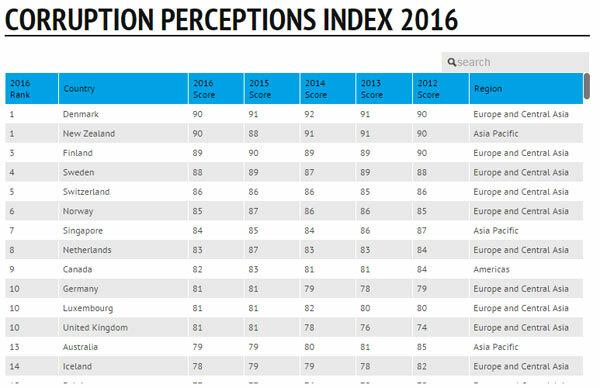 Globally, the data reveals that a staggering 69 percent of the 176 countries scored below 50 in the 2016 CPI, indicating high levels of perceived public sector corruption prevalent throughout the world. 2016 also marks an alarming trend where more countries declined rather than improved in the overall performance. Executive Director of Transparency International Sri Lanka (TISL) Asoka Obeyesekere said that despite the passing of the Right to Information Act and the adoption of the Open Government Partnership National Action Plan, Sri Lanka was yet to see anti-corruption rhetoric which would lead to strong action. He said a legislative reform agenda alone is insufficient to put an end to impunity. Controversies such as the Bond issue, the alleged Australian corruption scandal implicating the President and delays in corruption related prosecutions have raised serious questions about the government’s commitment towards ‘yahapalanaya’ and anti-corruption.